Most adults will experience some form of lower back pain during their lifetime. While this pain may range from mild to severe, any form of lower back pain has the potential to affect how you live your day-to-day life. The key to managing this type of discomfort is to determine when your pain could be caused by a serious condition and what treatments are available to help you get back to your normal quality of life. At Tahoe Fracture and Orthopedic Medical Clinic in Reno, Nevada, we have orthopedic doctors who specialize in treating spinal conditions, and we can create for you a personalized treatment plan specific to your needs and lifestyle. If you find that your lower back pain is not going away with at-home remedies like rest and over-the-counter pain medication, you should schedule an appointment with one of our orthopedic doctors in our Reno clinic to determine the cause of your pain. We will begin by performing a physical examination, which will allow us to determine the location of the pinched nerve in your lower back and also the severity of the nerve compression. In some cases, the symptoms of lower back pain can radiate into the buttock, leg and foot on one side of the body. We may also have you undergo an imaging test, such as an X-ray or MRI, to have a clear view of what is causing your nerve pain. To treat these conditions, your doctor may recommend a series of conservative therapies, which can include pain medication, physical therapy, weight loss and corticosteroid injections, to name a few. While these treatments are often effective for patients, sometimes patients will complete several months of conservative therapy without experiencing any lasting relief. 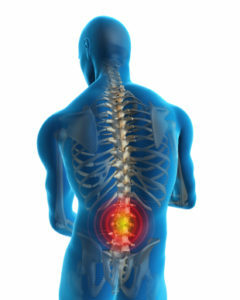 If this is your situation, your doctor may recommend spine surgery. At Tahoe Fracture and Orthopedic Medical Clinic in Reno, NV, our orthopedic surgeons perform a number of spine surgeries designed to relieve the pressure on the pinched nerve that is causing your lower back pain. To learn more about the treatments we offer, contact our office today.